Table tennis playing surface made of melamine resin are extremely hard-wearing and shockproof. Alu composite panels offer an improved ball bouncing for same weatherproof features. The frame construcion of a table tennis board determines its loadability and durability. Some table tennis tables of our range of products have a reinforced frame for a very high loadability. Some of our table tennis tables are foldable for storage and transport. Foldable table tennis tables also offer to exercise alone. 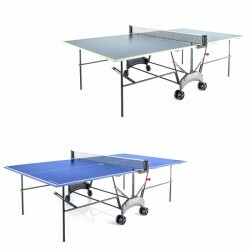 Choose your desired color of the playing surface of your table tennis table. A solid outdoor starter table with the new and practical detail solutions of Kettler. The Kettler outdoor table tennis table Axos 1 is suitable for quick table tennis matches in the garden thanks to a simple folding mechanism and light weight. Its weatherproof composite board offers good playing features and is great for beginners. The coating of my Kettler Axos outdoor 1 is just made for my feared spin balls! Quickly set-up, you can just start playing matches with the whole family. The Sponeta table tennis table S5-73e is optimal for club and school sports as well as the advanced private use due to its robust base and its high quality melamin resin board! An easy, quick and mainly safe access to the Sponeta table tennis table S5-73e is given by the innovative bracket folding system. The Kettler table tennis table Outdoor 6 is equiped with a practical one-hand locking and is very easy to use - even for children. The Kettler outdoor table tennis table Axos 3 is characterized by a quick and comfortable dis/assembly. The fixed net folds according to the table position (open/close). The boards are made of high-quality aluminum composite boards and offer good playing and anti-glare features. 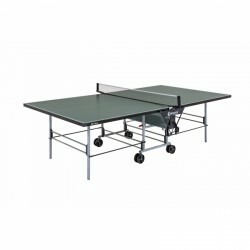 The Sponeta table tennis table S6-80e/S6-87e is a first-class and stable outdoor table tennis table, which convinces by its long durability and excellent playing features. 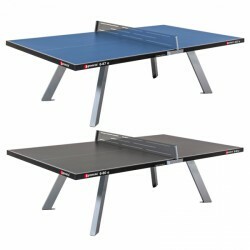 The Sponeta table tennis table S6-80e/S6-87e is ideal for the use at home as well as at school and clubs. The Kettler table tennis table Outdoor 10: an outdoor table tennis table of top quality with many conveniences. The Sponeta table tennis table S3-46e/S3-47e is equipped with a 5mm melamin resin board. Melamin resin boards are resistant against humidity and sunbeams and are ideal for playing table tennis outside. 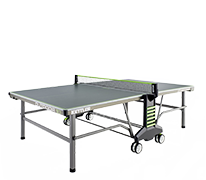 In addition, the table tennis table S3-46e/S3-47e of Sponeta offers good ball spin features as well as great stability and safety. Incl. ball and racket holder, fixed on the side, for storing four balls and two rackets. 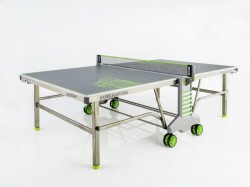 The Kettler table tennis table Urban Pong features a playing surface in urban style and a sturdy steel tube frame. The scratch effect makes each table a unique piece without affecting the playing features. The weatherproof Sketch & Pong outdoor table tennis table of Kettler is perfect for a (still) young generation of leisure players, who do not look for traditional rules - the Kettler Sketch & Pong table tennis table with playing surface on which you can paint. As I keep this table outside all year round (covered), kettler was not an option so I had to go for a melamine top. Was originally going to get Cornilleau 200S but this table has 6mm melamine top, better bounce, better frame and it's class for the similar price. In comparison to this brand I would say it's similar or close to 400S model which is more expensive. Good sturdy table, frame, legs and especially undercarriage feels very solid.Easily transported on the patio and even bumpy lawn and due to strong undercarriage i can easily lift one side if going over patio steps or doorstep. It has plastic corners and while these are not rounded, it makes it safer for kids running around. Folding system is simple and works well but it doesn't lock when unfolded like in Cornilleau tables, though I am not sure if this is a bad thing as it makes it easier to align both halves when using on uneven bumpy ground like my lawn. Net tension and height is adjustable, net stays in position when folded. Table feels very solid and not flimsy as other in the same price range. The only flimsy part is bat and ball holder - this is because it is attached by two screws only, however it stays in place and serves the purpose. Table also has ball holder for 8 balls (4 each side) on the frame and I like them more. Wheels do not lock but I doubt it makes any difference as table stays in on place. Assembly was easy - thanks to YouTube video and instruction. I think it took me about 2-2.5 hours to assemble, second person is needed only when attaching table tops. I understand that Sponetta manufactures tables for well known brands and this table is basically same as Donic Outdoor Roller 1000, Stiga PERFORMANCE OUTDOOR (5mm top though), Dunlop EVO 7000 Outdoor etc, they just attach stickers with different logos. Delivery to UK was very good - ordered on Saturday bank holiday w/e and it was delivered on Tuesady the week after. Communication very good too - lines are open on Sundays too. Overall - very good table and good service. Apart form taking some time to assemble (> 2 hours) this table is excellent quality and extremely easy to fold for storage. So much so, the children are motivated to fold up and roll under cover for protection from the weather. The playing surface and ball reaction is top quality for an outdoor set. We have already enjoyed many hours of play after only a short time. The table is easy to assemble and quite sturdy; I expect that it will last a long time. It seems to play well to me. My complaints are very minor: The height of the two halves of the table are not adjustable in the center, only at the ends, and the heights differ where they meet by about 2 mm...not enough to make a difference at our level of play. And if you want to use the rounded corners for protection, they fall off every time the table is folded for storage. Good quality table, seems made to last. Take some time to build and you need to be two for some parts. The outdoor table tennis table: ideal for matches in the open ! Table tennis is a classic indoor sport. When you wish to play outside in the garden in spring or summertime, we recommend to purchase an outdoor table tennis table. A weatherproof table tennis table has a special-coated surface and is protected from UV radiation. This means that the outdoor table tennis table does not bleach out or loses its good playing features for direct sunlight. A non-weatherproof table tennis table can even swell up due to humidity. This is different with outdoor table tennis tables. A little shower doesn't matter. However, the outdoor table tennis table should be stored inside for on-going bad weather or in winter time. 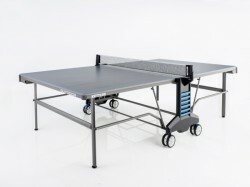 The weatherproof table tennis table has all functions of an indoor table. You do not have to renounce any functions of a "normal" table tennis table for an outdoor table tennis table. An outdoor table tennis table has also official international tournament dimensions. Like indoor table tennis tables, there are also foldable outdoor ones. Store the weatherproof table tennis tables in a space saving way, when they are not needed. One side folded up even offers exercising alone, when there is no match partner or you wish to exercise precise shots. Change of location is easily done for most weatherproof table tennis tables. 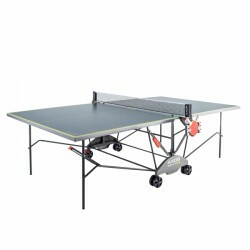 Just take an outdoor table tennis table equipped with transport wheels for easy and comfortable transport. Many outdoor table tennis tables are additionally equipped with balls and bats, so that your equipment is comfortably and directly stored at the place of the match. A net is usually included in delivery as well. Does the colour of the table tennis table matter ? Most outdoor table tennis tables have a gray, green or blue surface. Even though there are boards with other, more exotic colours, these three colours have prevailed. Table tennis balls are best to see on a blue, gray or green surface. 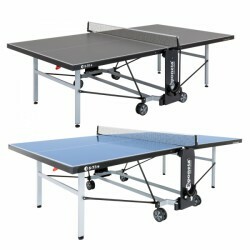 Whether you decide for a gray, blue or green outdoor table tennis table is up to your taste.